It began with just three tractors and an idea to effectively and efficiently transport freight to Walmart Stores, as well as pick up merchandise at suppliers. Now, 50 years later, Sam Walton’s vision has become the world’s largest retailer and one of the largest transportation operations around the globe. Our Private Fleet traveled 700 million miles last year, and did it as one of America’s safest fleets. To date there are 124 distribution centers which support over 4,000 stores in the U.S alone. 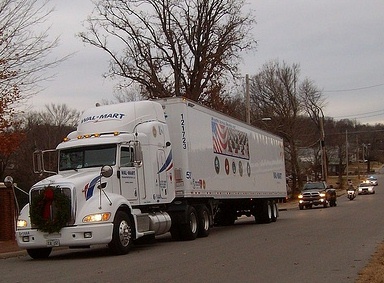 Over the past few years, Walmart has contributed to Wreaths Across America $375,000 in cash; $103,000 through in-kind transportation services; and delivered over 160,000 wreaths. Walmart is proud to sponsor this effort to recognize and remember our veterans that have served our great nation. Covering Parts of Arkansas, Tennessee, Kentucky, Louisiana, Texas, Georgia, South Carolina as well as Ground Zero New York City, The Pentagon, Shanksville (Flight 93 Memorial) and Arlington National Cemetery.